Gavin Hastings is convinced the form and try-scoring pedigree of Scotland full-back Stuart Hogg make him the favourite to take the Lions’ No 15 jersey in New Zealand this summer. Hogg has enjoyed a blistering start to this year’s Six Nations, scoring two tries in Scotland’s win against Ireland on the opening weekend, before touching down again in the defeat by France in Paris in round two. Former Scotland captain Hastings, who won 61 national caps, scored more than 600 Test points and toured twice with the Lions in 1989 and 1993, believes competition for the full-back jersey will be fierce this summer with Ireland’s Rob Kearney, Wales’ Leigh Halfpenny and England’s Mike Brown all pressing for selection. But Hastings believes Hogg’s attacking ability and lightning pace, coupled with his ferocious tackling and skill under the high ball make him the front runner for Warren Gatland’s touring first XV. Hastings called on Glasgow Warriors star Hogg to keep up the pressure on his rivals but also warned that, if he’s picked for the Lions tour, the real work will begin when he touches down in New Zealand. 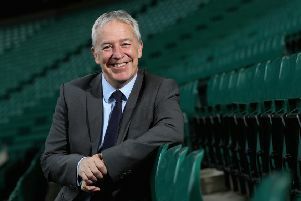 Hastings, speaking on behalf of Land Rover, a principal partner of the British and Irish Lions, added: “His defence probably needs to get a tiny bit tighter, it’s still good though but just in terms of his tackling he’s immense but every player will have stuff to work on and he will be no different to anyone else. “So far he has been terrific and it’s great to see him showing the promise and build-up that many people have given him before the Six Nations. “But certainly on the form of the first two games he is looking very sharp and I believe without a doubt he will be on the plane to New Zealand so that’s good from a Scottish point of view but equally from a Lions point of view as well. “This is not about picking 36 or 40 players; it’s about going down and being good enough to win a Test series for the first time in 40-odd years. “We must get away from the mentality of, ‘I’ve been picked for the Lions Tour’ and make it ‘I’m going to go down and win with the Lions’. “That is the message that needs to be repeated – it’s one thing being selected but that is when the hard work starts. Hastings also believes a strong Scotland can only benefit Lions coach Warren Gatland’s choices for New Zealand, believing an equal representation from the four Home Nations is the key to success. “I have been on many tours and I think the Lions miss something by not having enough players of any one country, and clearly in the last two or three tours there has hardly been anyone from Scotland,” said Hastings. “Now that is absolutely the way it should be, I’m a strong believer in picking players first and foremost on their ability and it doesn’t matter which country they come from. Meanwhile, Hastings believes the injury sustained by Scotland captain Greig Laidlaw that has ruled him out for the rest of the Six Nations is a major blow to the country’s chances of enjoying a successful campaign. Laidlaw, 31, suffered an ankle injury in the first half of the 22-16 defeat by France last weekend and left the Stade de France on crutches, with scans eventually revealing ligament damage. “It’s a big blow, obviously, he’s been a real inspiration for the Scottish team, over the last couple of seasons with the way that he has played and conducted himself and his goal kicking,” added Hastings, who is currently hunting for grassroots Lions fans to join Land Rover on the 2017 tour to New Zealand. “Just by its very nature, it’s a big loss but something that Scotland must deal with as it’s part and parcel of rugby at whatever level you play so it’s something the guys must get on with and regroup, someone’s loss is someone else’s opportunity to gain.